Never let anyone 'contaminate' your salmon fishing well by misinforming you that bright light river days are a waste of time. Many of my most memorable salmon fishing days have been ones where the light conditions were brighter than a big bag of bright things! That complete bright light nonsense would probably have been 'spewed' by an un inexperienced angler who's mind's needle 'naturally' tilts to the negative side of the dial. Ignore that rubbish if you ever hear it and keep well away from these types as their negativity could jump ship and contaminate you too! Staying positive and embracing all salmon salmon fishing conditions is the key & 'challenge' of success. Your salmon fly will never look as good in the water as it will on a bright light day and if we're seeing that difference I'll guarantee you the 'underworld' will be seeing it the same way! 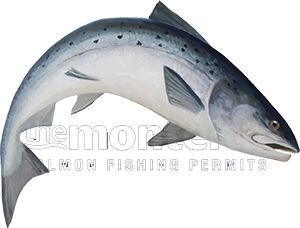 Having the versatility of thought to change and adjust your tactics beats the 'one dimensional' salmon fisher's approach all day long. If the salmon are lying deep then go deep after them. If the water is cold fish a slower fly and if salmon are not reacting to a big fly give them a 'sniff' of a small fly. There's an additional buzz involved in the capture of an older resident fish that's completely ignored a barrage of offerings when you come in at the back of fly fishers who've tried their best and you nail that old resident (that's been showing but not taking) with your first swing through the pool. I recall one such experience on the middle Tay where I couldn't get onto the best pool with a guest until the afternoon on a very bright light day due to a squad of herons that had their hand brakes jammed on for the entire morning (and the first half of the afternoon) before the head ghillie cleared the runway for a proper tactical attempt. This September bright light low water day saw 2 salmon hooked by myself & the head ghillie on controlled long distance heavy sink tip presentation that the salmon were definitely 'not' expecting having been totally 'conditioned' to expect only to see flies and lures swimming high above them and not right onto their noses! I know I keep repeating myself but excuse me as it's just my style of brain washing but to be 'consistently' successful in salmon fishing you need to be focussing at all times on what's going on under the waterline so stop looking at you're beautiful fly reel and the amazing scenery and become a sonar specialist! Next time you're out on the river try to get into this mindset as it will completely change the way you look at a salmon river. Start trying to visualise the shape, depth & contours of a salmon pool (under the waterline) and exactly where in the water column salmon are likely to be holding before targeting your suspicions with clinical precision!